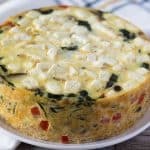 This frittata is perfect for breakfast or lunch to feed the whole family. Using sauté setting… Add sausage to pot and begin browning – breaking up sausage as much as possible and scraping up bits from bottom. Meanwhile – Crack eggs into a large mixing bowl. Add salt to eggs. Then, using a whisk, mix until yolks are broken up and fully incorporated. Add milk and whisk again, until eggs are light and airy. Once sausage is fully browned, add mushrooms and peppers to pot and cook for 3-4 minutes. You want mushrooms to release their liquid and then most of that liquid evaporate. Turn off power to pot, then add spinach. Mix continuously until all spinach is wilted. Spray 7-inch pan with nonstick cooking spray. Add sausage/vegetable mixture to pan. Pour eggs over top of sausage/vegetable mixture. Using a fork… gently “mix” in eggs. You’re not really mixing, just making sure the eggs reach the bottom of the pan. Add feta on top of egg mixture. Cover pan with aluminum foil. Add 1 1/2 cups water to pot, along with 3-inch trivet. Place pan on top of trivet and lock lid. Cook for 45 minutes at high pressure. Eggs may seep through some push pans or springform pans. We definitely recommend testing this with water first. If your push pan leaks more than a tablespoon or two, you may need to use a different dish. A greased glass baking dish or a metal baking pan of the same size can be used. Cooking time will be 10 minutes longer if using a thicker glass dish.